Please enter the name or word, up to seven characters. Please tell me the stone choices in the note to seller field if they will not fit here. Refer to the photos as a guide to which stones I offer. 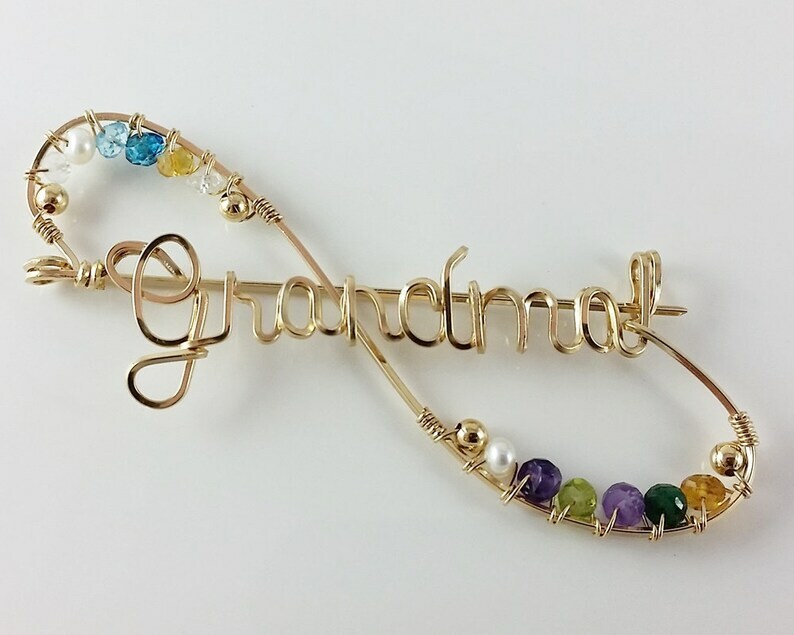 This pin is made from one single strand of 14K gold filled wire, curved into any name up to 7 letters. I add a back-swirl and up to 12 genuine birthstones. Please let me know the order of the stones you prefer left to right. If you choose only a few stones I can add silver or gold filled beads on the sides of them to fill out the look. You can let me know your choices in the message to seller field during checkout. I need to know the proper spelling of the name or word including capital lettering in it's proper place. If you show me the name in all caps, I will capitalize the first letter only and make it with the rest lowercase by default unless you convo me to discuss it. This makes an amazing heirloom. You can’t capture the beauty of these brooches in a photo. I truly couldn’t have been happier with my purchase, it made an amazing gift for my Grandparent, thank you so much.